30 Boxes is at its core an online planner that allows you to share events with your friends. Compared with services like Google Calendar, 30 Boxes doesn't offer a very different set of features other than its webtop, but the webtop seems more like an afterthought than an integral part of the site. The best reason to use 30 Boxes is its user interface design, which is very scaled down and simple to use. You enter events in the format: "event date time (notes)". So to enter in your plans to go to a party this Friday at 10 p.m., you would enter: "party friday 10pm". If you want to invite your friend Ann, you can enter "party friday 10pm +ann@gmail.com" and an email will be sent to her. There are a lot of other neat tricks: adding "[some address]" will create a link to Google Maps, adding a "*" will prioritize events, adding "private" will make sure your buddies can't see that event unless specifically invited, etc. You can even add tags to your event. To share a calendar with your buddies, you can send invites to them to join 30 Boxes. 30 boxes also has a slick user interface for its webtop that resembles OS X's Aqua UI. You can add links to MySpace, Flickr, Meebo, Google Calendar, and other sites to your dock. When you click on them, tiny windows open up allowing you to log-in to those sites. 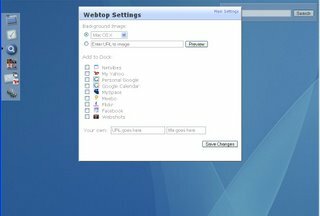 The webtop is kind of like a very specialized browser that allows you to quickly go to specific sites combined with a to-do list maker.